This recording and a version of this article were published on Ritual Well (USA) as ‘You have ravished my heart, my sister‘. Where in the Tanach can we find a text for celebrating a lesbian wedding, and an interfaith one at that? Strange as it may seem, I have such confidence in our rich and flexible tradition, that when I posed the questio n, I started with the assumption that I would be able to find such a text to use as a song lyric for my friends Ella and Natasha. 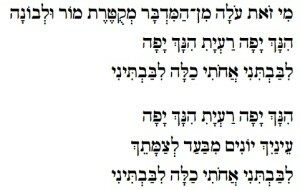 I assembled the lyrics for this song from phrases in Song of Songs (Shir Hashirim 3:6, 4:1, 4:9). Mi zot olah min hamidbar m’kuteret mor ul’vonah? Hinach yafah rayati; hinach yafah. Who is this who ascends from the wilderness, perfumed with myrrh and frankincense? Behold, you are beautiful, my love; behold, you are beautiful. In Hebrew, the word for heart can be leiv or leivav – i.e. have either one letter beit/veit, or two of them. The word translated as ‘ravished’ is libavtini (sometimes translated as ‘made my heart beat faster’). Libavtini is based on the ‘two veit’s’ version of ‘heart’. This song is about two people – the person speaking, and the person being addressed – two hearts, two worldviews. In the opening of the verse, the harmonies tilt back and forth strikingly and exotically between the two chords of A minor and G minor; the opening of the chorus tilts between the G major and D minor, first on the word libavtini itself, and then between the two words achoti (my sister), and chalah (my bride). So the distinctness and balance of the two partners is embedded in the words, and in the structure of the music itself. Judaism has, for centuries, evolved in prayer life, ritual and cultural practice in order to respond ethically and compassionately to contemporary perspectives. In the early 1900s, Martin Buber called for Jewish spiritual renewal. 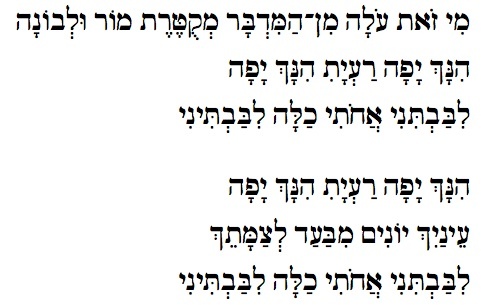 This song (along with the song Kumi Lach Rayati, that I also wrote for Ella and Natasha) is intended to ‘grow new shoots’ for Jewish life, at the same time as honour ancient Jewish ‘roots’ through using our traditional texts. Libavtini achoti chalah – ‘You have ravished my heart, my sister, my bride’. In the spirit of Buber, these words are expressed in a deep, direct, mystical, I-Thou encounter of two souls, two brides.